Though the Arctic can seem like one of the most inhospitable regions of our planet, it provides unique opportunities to scientists seeking to understand life and its many manifestations. 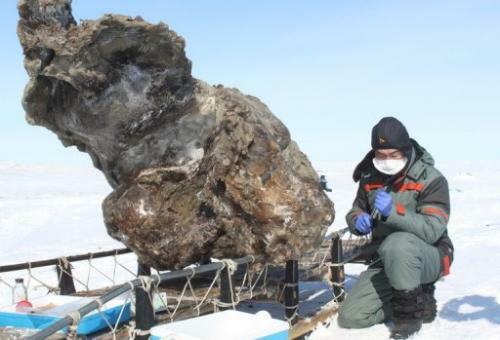 Recent examples of this in the news include the story of a frozen Mammoth carcass found to contain preserved blood and muscle tissue, and a report of plants called bryophytes found to be capable of growth even after 400 years of being frozen beneath a glacier. The Mammoth was found on an island in the Arctic Ocean and its blood reportedly “flowed out” when a part of the abdomen was broken off. As molecular biologist Beth Shapiro explained at TEDxDeExtinction, good ancient DNA is hard to find. This particularly well-preserved specimen could bolster efforts to get a really good sample of Mammoth DNA for the purposes of cloning and reviving this extinct species. The bryophytes, it seems, revived themselves, in a manner of speaking. Since the “Little Ice Age” of the 16th century, they’ve been covered by a glacier in northern Canada. Bryophytes are a simple, primitive type of plant and individuals discovered where glaciers have retreated in the last few years were found to be growing again after something like 4 to 5 hundred years of frozen stasis.